Discussion in 'Puppet News' started by BlueFrackle, May 24, 2003. This is my first attempt at a Fraggle puppet. He looks kinda like Boober, but that is good because thats the Fraggle that I am aiming for ! The image at the top is the final peice, The one under neath was just some feathers I had hanging around, So i thought it would be cool to make him look like Gobo. The head and arms are just fleece, Ive used no foam. I made the body out of the same fleece, Then made it again with the body fur (Which looks just like Gobo's!). The hair and tail are made from Ostrich Feathers, Then we made the hat out of some old looking (But expensive, I dont get it!) material. It turned out really cool ! I put some wire inside the tail so it can stand up by itself, I also made the wire go inside the body and come out of the 'sleeve' so I can make the tail waggle without reaching up and doing. and the hypocondriac Frazzle J. Wormgut. And the one above is incredibe, that is totally Boober, had you used the right colours you would have totally nailed both but i bet you must have wanted something original that's why you changed his colour. BlueFrackle, are you planning on leaving them naked or are you going to cloth them? 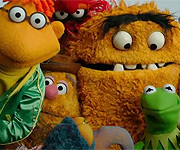 Absolutely fantastic fraggles...........very nice quality muppets!!!!! They are both excellent - Fraggle cousins ! It is really cool BlueFrackle!!! WOW! Those are great! I know people who dream of making puppets like that. Namely Mr.Penguin. That's awesome, man! I don't think I could ever re-make a Muppet that well! As hard as I may try. I can't wait to see your future puppets! I was wondering BlueFrackle if you could help me with a puppet. I've always wanted to make a Grover puppet. The only thing is that I don't know how tall he is? And the leanth in arms and legs? Could you help me or who ever wants to help. Great Job! Gotta love Boober! His fur looks just like the real Fraggles! how did you made his skin? is there a particular item number or name for the ostrich feathers you've used for the hair that you can share here? I can't locate feathers that look like that. I've even attempted to check with American Plum Company (or whatever it is) and couldn't see anything in their book that looked like those feathers. Absolutely awesome BlueFrackle. As per usual I might add! We gotta talk armrods one of these days. Thank you all so much for the kind words ! 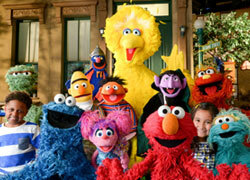 I also want to make a Grover, But i really dont know where to start, sorry! Those feathers arent what i actually wanted, They are a thing boa with those longer strands coming out of it. I wanted a complete long feathered boa. It doesnt have no name or number sorry. Come onto AIM and we can chat ! And i made the sking out of Fleece. Hey BlueFrackle, those are both Fantastic Fraggles!!! Sweet!